The creation of a new public park on derelict land in Newbold, Rugby has resulted in local residents feeling healthier, happier and being more active. The creation of a new public park on derelict land in Newbold, Rugby has resulted in local residents feeling healthier, happier and becoming more active. The findings in a report published today by Fields in Trust come as Parliament’s Communities and Local Government Committee recommend the wider value of parks, beyond leisure and recreation, should be recognised, suggesting parks should maximise their contribution to comprehensive local authority agendas, such as promoting healthy lifestyles, and tackling social exclusion. As an advocate for parks, playing fields and recreation grounds Fields in Trust has been calling for just such a re-valuing of greenspace, to take account of the vital contribution they make to local communities and ensure they are safeguarded for the future. The Fields in Trust report on Centenary Park shows that access to greenspace in local neighbourhoods makes a vital contribution to health and wellbeing of communities. The research into Centenary Park, Rugby shows, in microcosm, the value that locally accessible green space has on communities. Since Centenary Park opened three times as many people visit local parks daily than before; 60.2% visiting once a week or more. Over 60% of park visitors reported feeling happier and better about themselves and half said they had significantly more access to nature as a result. Crucially more than two-thirds of respondents said the most important reason for visiting the new park was for physical activity. This data reinforces the view that local green space is vitally important in meeting the government’s aim of creating a more active nation; an ambition which requires all kinds of formal and informal recreational space to be accessible. The Centenary Park case study demonstrates that despite the lack of traditional formal sports facilities the majority of respondents cite physical activity as the primary reason for visiting. Centenary Park is a former redundant allotment site that was transformed into a new park for local residents in Newbold-on-Avon, Rugby. 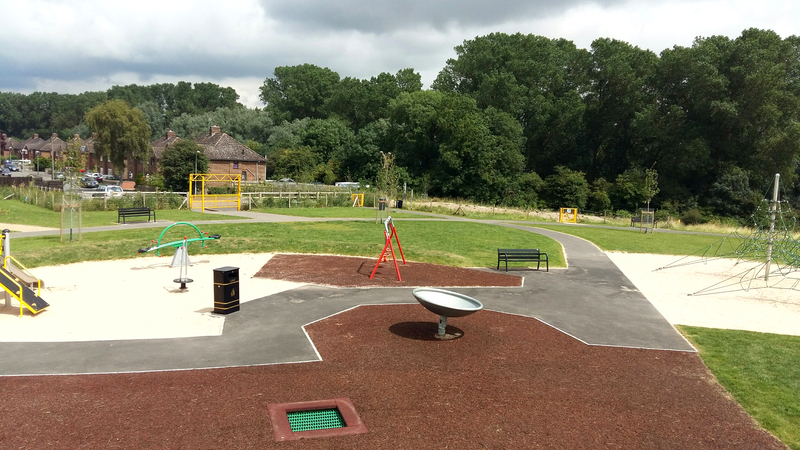 The park, which opened in April 2016 is 2.7 hectares in area has a green outdoor gym, play area, multi-use games area, wildlife meadow, butterfly bank, and sensory garden. The park has been awarded Green Flag status and is protected in perpetuity with Fields in Trust as part of the Centenary Fields initiative, commemorating those that served and fell in the First World War. As the housing White Paper, published this week has shown - there is pressure on land across the UK for housing and commercial development and existing planning legislation alone is not sufficient to prevent the loss of parks and playing fields. Land owners and local authorities like Rugby Borough Council have worked with Fields in Trust to independently secure their green spaces; ensuring accessible public recreational land is protected forever. Fields in Trust welcome the CLG Committee recommendation that Councils should publish a strategy to demonstrate the value of parks – but without the protection of this land there is no guarantee that the contribution green spaces make to health and wellbeing can be sustained. Centenary Park is making major contributions to local life as over 70% of users said they travelled less than a mile, illustrating increased access to green space for local people predominantly. . The proximity of the park to people in the local neighbourhood has increased park usage overall; prior to the park opening people were driving to the nearest park. Now more people are using local greenspace more often. People are also more likely to travel on foot - nearly two thirds (65.4%) said that they walked to the park compared to 44.4% who said that they walked to other parks before Centenary Park opened. Although this research was on one particular park, some of the simple measures of impact and value used in this case study are easily replicable elsewhere. Founded in 1925 as the National Playing Fields Association by King George V, their mission is the same now and as it was then: to ensure that everyone – young or old, able-bodied or disabled and wherever they live – should have access to free, local outdoor space for sport, play and recreation. These spaces are vital to building happy and healthy communities and sadly continue to be threatened by all kinds of development. Centenary Park Case Study Report: The findings come from a case study undertaken by social research company Substance to help inform Fields in Trust to assess the impact and value of open spaces. The case study involved documentary research, qualitative interviews and a survey for respondents (both onsite and offsite) conducted in September and October 2016. The published report details the findings from the survey as well as providing background to the development of the park. The park has benefited from being part of a wider strategic approach to green spaces by Rugby Borough Council which means there are clear objectives which helped engage other public agencies and funders. The report helps demonstrate how such parks are contributing to wider public agendas. Substance is a research and technology consultancy specialist in working with the sport; sport for development and outdoor recreation sectors. The core team is made up of highly-experienced social researchers, technologists and programme managers who share an ambition to help organisations that do good think smarter and have a greater impact.